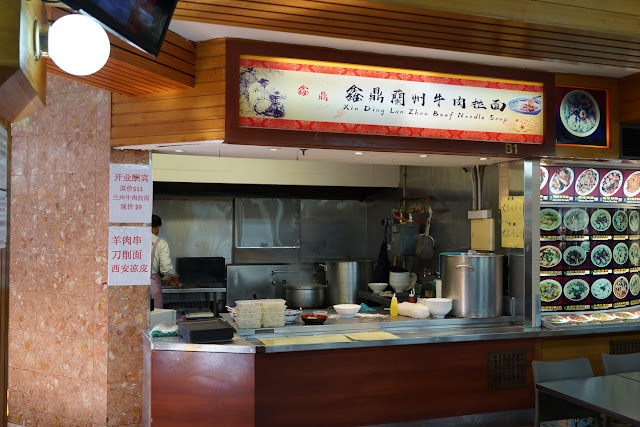 We haven't found a good Lan Zhou beef noodle soup in Chinatown since Kung Fu ramen closed (or kicked) it's doors, so we are stoked to see Xin Ding Lan Zhou Beef Noodle Soup appear in Dixon House Food Court. In the slow blink of a Tasmanian eye a new stall appears at Dixon House, in the corner spot where many a great stall has lived, most recently Ramen O-San, and we still miss Anna's Kitchen last tasted in 2013. 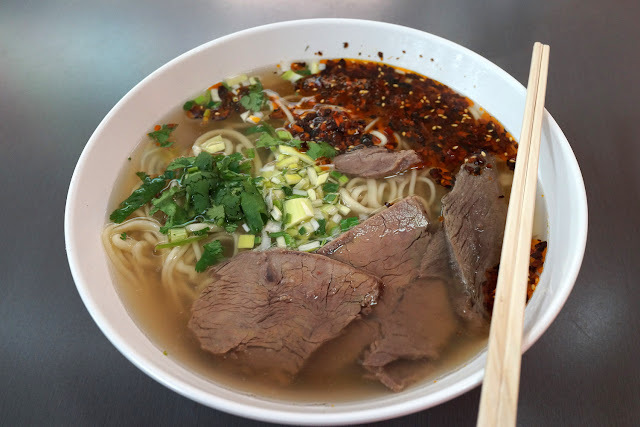 This corner spot has good food voodoo and just got better, for us anyway, we are big fans of Lan Zhou beef noodle soup - hand pulled noodles in a light, gentle beef broth with a couple of thin beef slices and optional chili. It's one of those soups that is so simple yet so good, best done by somebody specialising in it. The noodles are handpulled in front of your very eyes at the counter, they are pillowy soft and there is plenty of them. Mr Shawn vowed only to eat half the noodles for calories sake, but couldn't help but scoff the lot. Swine. We normally try and sample a few dishes before doing a post but, we are trying to break that boring habit, and besides, this just made Mr Shawn's day. Xin Ding Lan Zhou Beef Noodle Soup is in the Dixon House Food Court, where dreams come true, cnr Little Hay and Dixon Street, Chinatown. Agree the Lan Zhou noodles here are the ant's pants. I daresay even better than Kung Fu's (were). I hope they stick around.